Logic 5.0 hoisted commercial door operators are optimal for industrial applications. These operators include a floor-level chain hoist to ease manual operation in an emergency or power outage. The door operators are typically mounted to the wall when used with larger sectional overhead doors with vertical or high lift and mounted to the wall or the front of the hood when used with rolling doors and grilles. H Operators are attached to the door jackshaft to indirectly drive the door. MyQ® Technology enables you to securely monitor and control your facility door operators and lights with your smartphone, tablet or computer for greater piece of mind. Alerts can be received as email or pop-up (push) notifications. Floor-level chain hoist with electrical interlock provides easy disconnect and manual operation in an emergency. Control function selector dial allows for easy selection and programming of (7) wiring types, from constant pressure to close to specialized Timer-to-Close functionality to meet end user needs. Mid-stop enables partial opening of door to a preprogrammed position for energy savings and convenience. Dual voltage connections increase flexibility by enabling the installer to select the required voltage within phase to meet job-site requirements. Within phases, voltage is selectable at the time of installation with the placement of a connector. 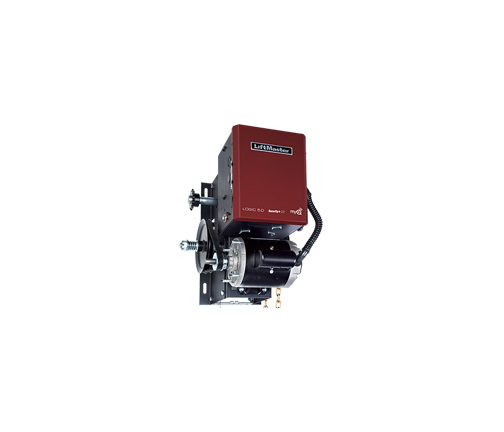 Continuous-duty high-starting torque motor with instant reverse and overload protection. Capacitor start with single phase, removable without affecting limit switches. Maximum run timer reverses or stops door if closing time exceeds expected time frame to limit damage to door and operator. 3-Button Control Station with Maintenance Alert System (MAS). Drive reduction, first stage heavy-duty 5L-V-belt; second, third and fourth stages #48 chain; #50 output sprocket chain. Bearings/bushings: industrial ball bearings on 1 in. output shaft; heavy-duty oil-filled bushings on reduction shafts. Brake: standard on ¾ and optional on ½ HP. Construction: NEMA 1 rated type electrical box, heavy-duty 11-gauge steel frame with durable powder-coat pinned to shafts. Door speed: 8-9 in. per second. Security+ 2.0 radio receiver is standard on-board with logic 5.0 Operators, and virtually eliminates radio frequency interference. Accepts up to (90) 1-button or (30) 3-button remote controls plus up to (30) wireless keypads or an unlimited number of DIP switch remote controls. LiftMaster® Commercial Door Operators comply with UL 325 standards. LiftMaster offers a variety of entrapment protection devices for every commercial application. Emergency Disconnect, disconnects door operator from door for manual lifting in an emergency. NOTE: On steel-insulated doors, a 24 ga. back panel is assumed. If heavier back panel is supplied, use the next higher HP rating. For doors 22ft. wide by 20 ft. high and larger contact your LiftMaster Sales Representative.